The two advertisements, which I have chosen to compare, are on car and a pair of tires. 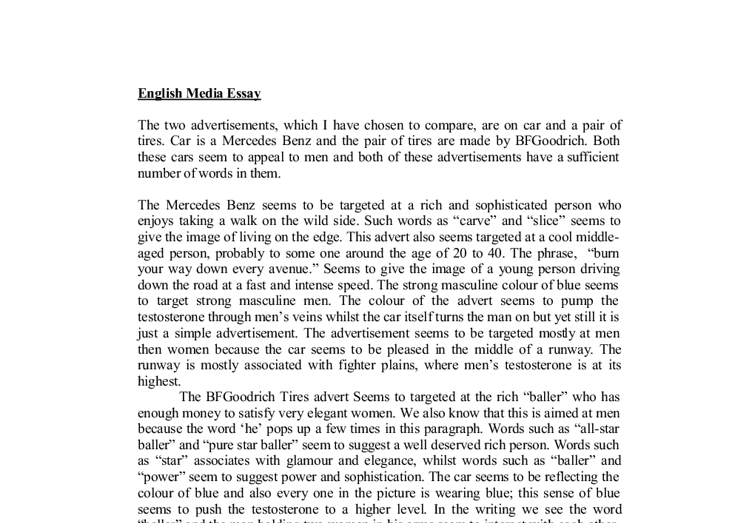 English Media Essay The two advertisements, which I have chosen to compare, are on car and a pair of tires. Car is a Mercedes Benz and the pair of tires are made by BFGoodrich. Both these cars seem to appeal to men and both of these advertisements have a sufficient number of words in them. The Mercedes Benz seems to be targeted at a rich and sophisticated person who enjoys taking a walk on the wild side. Such words as "carve" and "slice" seems to give the image of living on the edge. This advert also seems targeted at a cool middle-aged person, probably to some one around the age of 20 to 40. The phrase, "burn your way down every avenue." Seems to give the image of a young person driving down the road at a fast and intense speed. The strong masculine colour of blue seems to target strong masculine men. ...read more. The car is taken in such an angle that it looks quite cool and fascinating. The car does not look over powering, the camera angle give you the image of being layback, this might suggest that once you're in the car you will feel layback and cool. The name Mercedes Benz is already associated with high class, expensive, business class people. The colour of the car seems to make the car look even more expensive than it already is. This advertisement can associate with every boy's fantasy; most boys at an early age are fascinated with racing cars. This car seems to be set in the middle of a racing area where boys can just chill and do what they like to do best. To a girls point of view this car can be associated with an independent women, a women that does not need a man to satisfy her. A stereotypical person in this car would be a businessman or women. ...read more. Sharp can also mean sharp and smart looking. The word butter gives the image of being slick this also gives the image of a person driving down the road in their new slick Mercedes Benz. The phrase "you'll look good in it too" gives the impression that the car is good looking so in conclusion would make you look good as well. The Mercedes Benz logo is actually quite simple, it only has two colours and it is not big but yet still in stands out. The symbol in the middle of the logo is a three-pointed star this relates to being absolutely perfect and also total peace. The style of words in the BFGoodrich Tires advertisement is quite formal. There are hardly any words in this advertisement, which could be considered as slang. Although the picture in this advertisement might suggest that these tires are for young people, the wording might suggest that this tires are also for people who are serious with there life. The word "leap" means big jump, this might suggest that if you buy these tires you would be going for the jump of you life. ...read more. He has a serious expression on his face. They are stood very close to each other although he is facing directly towards her while she is turned away slightly from him. The photograph is black and white. It is not clear what is in the background because it appears to be hazy. More convenience is created for the potential buyer. The information on the advert might not have been enough for the reader so there is an Apple information centre. 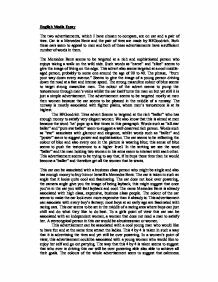 The writer even found more ways to persuade the reader by supplying a free video. "Our comprehensive information pack includes a free video." Hundreds of thousands of people went through the cKone e-mail. Charlie as it is part of Revlon, they do not have an official website and it does not sell a lot of its products through the internet. Charlie is mostly sold in pharmacies and in not in big stores like Debenhams. The Nissan X-Trail has a jam packed page full of colours and images just like an action packed computer game, in contrast to the Fiat Seicento 2Tone, which has a very unadorned almost quiet like setting with very appealing titles, logo's and mottos to attract the readers attention. In one of the advertisements there is a young girl standing next to a ' Super Kitchen' which has a pretend hob, espresso coffee machine, strawberry scented pot, cooking utensils, sink and tap. In addition, there is a cleaning trolley given free if the Super Kitchen is brought. Do you shop through internet or retail stores? __________________________ 11. Do you use mail order services? ______________________________________ Thank you for your time. By using questionnaires Power Leisure can asses what mediums of advertisement it can use to the most effect and can enforce advertisement of the business in places where target audience is most populated to attract as many customers as possible to make larger profits.